"Legion" redirects here. For other uses, see Legion (disambiguation). 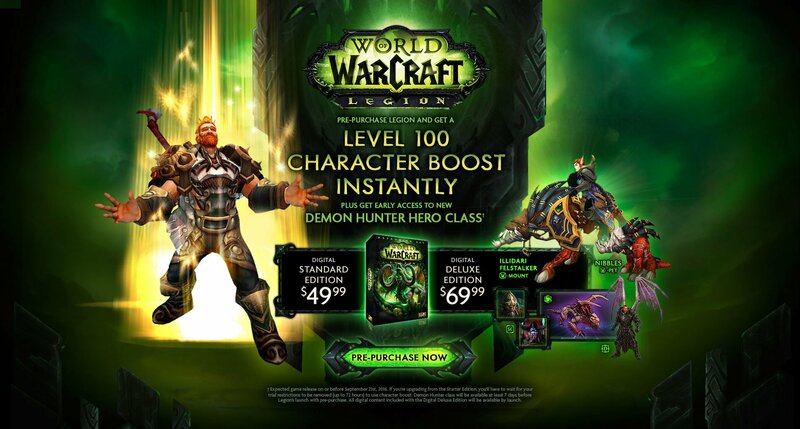 World of Warcraft: Legion is the sixth expansion for World of Warcraft. It was announced at Gamescom on 6 August 2015 and released on 30 August 2016, selling 3.3 million copies by the end of launch day. The expansion's alpha went live on 23 November 2015, then concluded on 10 May 2016 in order for the beta to start two days later. The pre-expansion patch, Patch 7.0.3, was released on July 19, 2016. Legion comes in three versions: Standard Edition, Digital Deluxe Edition and Collector's Edition. The Tomb of Sargeras has been reopened, and the demons of the Burning Legion pour into our world. Their full, terrifying might is fixed on summoning the Dark Titan to Azeroth-and they've already located the key to his return. With the Alliance and Horde devastated, adventurers must take up legendary artifacts and weapons used by the heroes of old, scour the ancient Broken Isles for relics of the Titans, and challenge the Burning Legion before Azeroth's last hope dies. Following the events of Warlords of Draenor, the alternate Draenor's Gul'dan is expelled by his demonic masters into the original Azeroth with a special purpose - to reopen the Tomb of Sargeras and the gateway to Argus, commencing the third invasion of the Burning Legion, an invasion even greater than the War of the Ancients. Gul'dan also had to find and steal the body of the famous demon hunter Illidan Stormrage. After the defeat at the Broken Shore, the defenders of Azeroth found themselves exploring the long-forgotten Broken Isles in search of the Pillars of Creation, titan relics which were used to shape the world - and which were Azeroth's only hope for closing the massive demonic portal at the heart of the Tomb. However, the Broken Isles - a land which 10,000 years ago was home to the then mighty night elf civilization - came with their own perils to overcome, from the demon lord Xavius and his satyr armies, to the vrykul's God-King Skovald, to the powerful nightborne night elves, and the deadly naga led by Tidemistress Athissa. As part of this desperate search, the Kirin Tor, now led by Khadgar, moved the floating city of Dalaran to the shores of this land, with the city serving as a central hub for the efforts of the world's heroes. The death knights of Acherus also took their floating necropolis to the Isles. To defend their world against the onslaught of the Legion, the heroes of Azeroth sought out legendary artifact weapons to wield in battle, but also found themselves embracing new and unexpected allies in the form of the Illidari, Illidan's elite disciples, freed in desperation by the Wardens that guarded them to fight against the Legion in this hour of need. Ongoing conflict between the Alliance and the Horde led to the formation of the class orders, with exceptional commanders putting aside faction to lead their classes in the fight against the Legion. The expansion will see story-based modifications made to Dalaran, including changes to the center (most notably Aegwynn's Tower) as well as the Underbelly, which saw a new free for all PvP area. Customizing the Ashbringer at the paladin Class Hall. Artifacts are a special new type of weapon, and are the only weapons players will wield over the course of the expansion. Players can acquire these new weapons early in the expansion's run, and the weapons will grow in power alongside players. Players will be able to earn Artifact Power through engaging in most types of play, and can spend this to unlock a unique tree of traits traced upon the form of their Artifacts, enhancing their abilities. Players can also obtain relics from major content such as dungeons and raids, and use these to upgrade the Artifact itself. Artifacts also come with an extensive range of visual customization options. There is an Artifact for each class specialization, 36 in total. For example, Blood death knights and Frost death knights will have different Artifacts. Obtaining each Artifact will involve a unique quest to seek out these powerful weapons. Class Orders represent the collective effort of each class to band together to face the threat posed by the return of the Burning Legion. With tensions between the Alliance and Horde preventing faction leaders from working closely, it is up to the classes themselves to unite to focus on this threat, and do what needs to be done. After their success on Draenor, the player will be looked to as the leader for their entire class. The Class Order creation process will begin with the acquiring of an Artifact. With this serving to inspire the allegiance of the other member's of the player's class, the player will found their Class Hall. The paladin Class Hall, in a hidden templar sanctum beneath Light's Hope Chapel. Class Orders will have their base of operations at unique Class Halls, special locations with a strong connection to the class. These class-specific areas will only allow access to players of the corresponding class, and will serve as a center for coordinating the efforts of that class, including sending champions on missions. Class Halls are in many ways Legion's counterpart to Warlords of Draenor's garrisons. They serve as a secondary hub for players outside of the main capital of Dalaran, and allow players to command a team of champions to undertake special missions. A key difference to garrisons is that the Class Halls are realm-wide, and will be open to all characters of that class, including characters of both factions. Class Halls are also not intended to players' main residence during the expansions, but instead somewhere to travel to to send champions on missions, customize Artifacts, and pick up special quests, before likely returning to the capital of Dalaran. The evolution of Warlords of Draenor's follower system, Class Halls will feature class champions, which the player will be able to send on missions. In contrast to the follower system, which saw players recruiting a large number of miscellaneous characters, in Legion players will command a far small force of exceptional champions, with some fairly major lore characters such as Lady Liadrin for the Horde. As with followers, players will send their champions on missions, but these missions will be more integrated into the rest of the game experience, unlocking content and enabling the player in related zones. For example, missions may open new areas for questing, or grant special buffs to the player while in certain zones. Players are intended to work alongside and with their champions, rather than competing with them for rewards. A major theme of Legion will be the forging of clear and distinct identities not only for each class, but also for each specialization. While some of this will be achieved through the Class Order and Artifact systems, the developers also plan on making significant changes to the concept, design and in some cases main functionalities of the existing specs. Some specs will be renamed. Earning ranks in the new honor system. Legion will see some of the biggest changes to the player vs player experience in the history of World of Warcraft, with the removal of PvP gear, a dramatic reduction of gear significance in PvP, the disabling of trinkets, set bonuses, enchantments and gems in PvP, automatic adjustment of player stats while in PvP, and the introduction of the first true honor talents. A major theme of Legion will be the separation of PvP and PvE, to an extent that has not been seen before. Long requested by some players, the division is intended to finally allow the designers to create two different versions of the classes, allowing for far better balance in both arenas. At the heart of the changes lies the new honor system. The new system will remove [Honor Points] and [Conquest Points], replacing them with a new PvP talent system, granting access to new abilities that will function only in PvP combat, representing the major division in abilities between PvP and PvE. Players will also be able to earn "prestige ranks" for access to cosmetic rewards. The intention is that players who wish to focus purely on gameplay can quickly reach the maximum power for their character, and enjoy PvP without being at any disadvantage. Meanwhile, those players interested in cosmetic rewards, or simply attaining recognition for their achievements, can choose to pursue the prestige ranks, giving them more substantial goals to work toward over time. The new honor system is also intended to heavily reduce the importance of player gear in PvP play. In the new system, the significance of gear will be heavily scaled down, with the best gear in the game providing perhaps a 7% advantage over a character who has just reached max level. This aims to still provide some satisfaction from acquiring new gear, but to for the most part remove the significance of gear from PvP, returning the focus to playing ability as well strategic options such as talent choices. It will also see the complete removal of PvP gear itself, along with PvP stats such as resilience. When entering a battleground or PvP area, the stats of each player will be adjusted automatically based on their specialization. This is intended to allow the developers to balance each class and specialization for PvP specifically, without affecting PvE. Trinkets, set bonuses, enchantments and gems will no longer activate in PvP. This again serves to separate the two types of play. Their removal is expected to dramatically reduce unpredictable burst damage, making sustained damage more important. The impact of these effects will be replaced by the PvP talent system. For example, the traditional PvP trinket will be replaced by the very first PvP talent earned. The internal alpha has already started. The alpha for Legion went live on the 11th anniversary of the release of the original World of Warcraft. Flying will not be available at launch, but will come later much like in Warlords of Draenor. It was stated that BlizzCon 2015 would most likely have the "first playable tour of the world". The demon hunter class has been considered since Wrath of the Lich King. They were added for this expansion because it finally fits into the story. Demon hunter was also considered for The Burning Crusade, but the developers were not ready to add another class at that time. Legion has the most voice acting of any expansion to date. It was decided that the intro cinematic feature a war-zone, but the "emotional hook" was decided upon later. Going into war tropes, the cinematics team settled on the idea of an individual writing letters home, and echoing the themes of "why do we fight?" and "what is worth fighting for?" Original concepts had these letters being written by an Alliance footman, and transitioning the sequence to an orc grunt. The sequence would end with Varian writing a letter to Anduin. It was decided that while it was clear that the Alliance and Horde were on their way to fight the Burning Legion, they would be fighting the environment itself to some extent. The design of the airships was taken from 18th century frigates. Fel lords and felguards marching to battle. Early art of the Broken Shore, before being reimagined. "The Burning Rage" by TamplierPainter. "Light and Shadow" by Angju. "The Common Enemy" by Sunstrider. "The Hatred of Ten Thousand Years" by Atilla Kaan. "The Tomb of Sargeras" by Dmitry Vernygor. "Heralds of the Legon" by Genesisnx. "The Ashbringers" by Hagmann Art. "WoW Legion" by Hanawaro Arts. "Ysera and the Emerald Dream" by Leslie Casilli. "Stand United" by Lion Crowe. "Demon Hunter by Szabados Zsolt. "The Last Hope" by Zhadnost. ^ a b c Image from official site (cached by MMO-champion). Retrieved on 2015-11-05. ^ The Legion Returns August 30 - World of Warcraft. Retrieved on 2016-04-18. ^ a b MMO-Champion: Legion Alpha Live, Wardrobe UI, Artifact Weapon Videos (2015-11-23). ^ Legion Dev Update Liveblog with Jesse Cox and Ion Hazzikostas - Beta Starts May 12th!. Wowhead News (2016-05-10). Retrieved on 2016-05-11. ^ Official site - Legion. Retrieved on 2015-08-13. ^ a b c d e f chaud 2015-08-09. Legion Dev Talk, Dev Interviews. MMO-Champion. Retrieved on 2015-08-09. ^ a b c d Dev Interviews, Rogue Order Hall, Blue Posts, Warcraft Movie Prop Contest, DLC #500 (2015-08-11). ^ a b Brian Holinka talks PVP in Legion (2015-08-17). ^ a b chaud 2015-08-21. Patch 6.2.2 PTR - Build 20426, Dev Interviews, Patch 6.2.2 Development, Blue Tweets. MMO-Champion. Retrieved on 2015-08-21. ^ chaud 2015-08-08. Dev Interviews, August 6-7 Hotfixes, Blue Posts, Pet Battle Bonus Event, Legion Art. MMO-Champion. Retrieved on 2015-08-09. This page was last edited on 12 November 2018, at 20:32.